OAKLAND — Yusuf Bey IV wants to serve as his own attorney in a real estate fraud case — a move that could allow him to make unmonitored telephone calls from jail as he is being investigated on suspicion of ordering the deaths of witnesses in his upcoming triple murder trial. Like those of all prisoners, Bey IV’s phone calls are routinely recorded. However, jailed defendants representing themselves receive use of phones without recording devices so they can speak to witnesses and others confidentially. Lim said after the hearing that the concerns are because of the witness plot. Christopher Lamiero, the prosecutor assigned to Bey IV’s other case, could not be reached Wednesday. McGuiness set a hearing on Bey IV’s request for next month. Dressed in a bright red jail jumpsuit, Bey IV spoke briefly from behind a glass partition in McGuiness’s courtroom Wednesday morning. He said he had filled out papers to fire Theodore Johnson, his attorney in the real estate case, and represent himself. “This is what he wants to do,” Johnson told the judge. The real estate case appears minor compared to the violent felonies accusations Bey IV faces — including charges that he ordered Oakland journalist Chauncey Bailey and two other men killed in the summer of 2007. He is charged with using aliases and forged documents to acquire several properties and mortgages in 2006 and 2007. He will not be tried for fraud until the other cases are resolved. The case has remained dormant on McGuiness’ docket for more than two years. Then, last month, court papers showed that Bey IV raised the idea of representing himself. That request came after Gary Popoff, one of his bakery followers, was jailed after he was caught carrying court papers on which Bey IV had allegedly scribbled orders to kill witnesses in the Bailey case. Popoff was jailed for a parole violation; an investigation of the matter is ongoing. Lorna Brown, Bey IV’s former lawyer in his murder case, is being investigated on suspicion of carrying the papers containing Bey IV’s note out of Santa Rita Jail and giving them to a Bey family member who then gave them to Popoff. Brown resigned as Bey IV’s lawyer shortly after Popoff was jailed, citing a conflict of interest. Spencer Strellis, Brown’s attorney, did not return a message Wednesday. Popoff has yet to be charged in the witness investigation. He was moved last week from county jail to state prison after a hearing officer found his possession of Bey IV’s notes was a parole violation. 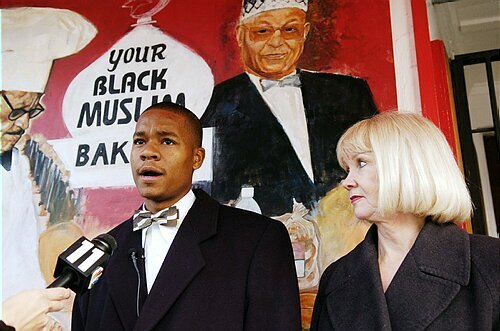 The act of “obtaining the transcripts are sufficient, substantial evidence of (Popoff’s) active participation in Your Black Muslim Bakery and its continued felonious conduct,” a summary of Popoff’s parole revocation hearing states. Bey IV is next due in court June 21 for a hearing on a change of venue motion in the Bailey murder case.